(CNN) -- Though searchers believe that they have found debris from an Air France jet that disappeared off Brazil's coast Monday, finding the entire plane and learning exactly what downed it could be a tedious, years-long process. 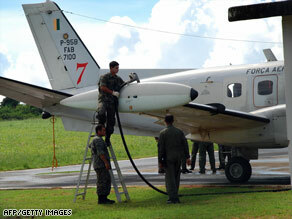 A Brazilian radar plane is fuelled up Monday at the Fernando de Noronha airport to search for Flight 447. Many factors can complicate a search effort. Tradewinds and ocean currents can quickly scatter wreckage across several square miles, and the plane's altitude -- almost 7 miles, in the case of Flight 447 -- can make it difficult to pin down where the aircraft hit the water. "It's a big ocean," said John Hansman, director of the Massachusetts Institute of Technology's International Center for Air Transportation. "Once you're offshore, you're no longer in direct radar contact." It varies from airline to airline, but passenger jets generally send location reports every few hundred miles when they're over open water, Hansman said. Flight 447 was carrying 228 passengers and crew members from Rio de Janeiro to Paris, France. About three hours into the journey, more than 200 miles off Brazil's coast, the jet transmitted 10 maintenance reports: one for each piece of malfunctioning equipment, the professor said. About 10 to 15 minutes later, when the Airbus A330 was scheduled to be over the Canary Islands -- where the radio would generally function better, because the plane is over land -- Flight 447 was expected to send a location report but didn't, Hansman said. "You don't know that you lost contact until it didn't make its position report," he said, but "missing one position report is not that big a concern. When it didn't check in over the Canary Islands ... that's when they realized something was seriously wrong." TIME.com: What might have made plane disappear? Identifying the search area is also difficult. In the 10 to 15 minutes that passed between the maintenance reports and the missed location report, the plane could have covered about 150 miles, Hansman said. Rescuers will use aircraft, flying 1,000 to 2,000 feet above the water, to search the area on a grid. They look for an oil slick, life rafts or other evidence of the crash, Hansman said. Finding debris can be difficult because only small items such as seats, life vests, pillows and personal belongings will float. "The components of the wreckage are going to spread out due to the currents below," he said, explaining that heavier parts such as the engine will sink more precipitously. "Lighter parts drift more with the current." Another factor muddling rescuers' efforts is the Atlantic Ocean's depth in the area where Flight 447 disappeared. It can reach up to 2 miles below sea level at some points, experts said. Salvagers spent more than six months recovering plane parts and victims from the waters off Long Island, New York, after TWA Flight 800 crashed there July 17, 1996. The Paris-bound flight exploded about 13 minutes after takeoff from John F. Kennedy Airport. On October 31, 1999, EgyptAir Flight 990 crashed in water about 250 feet deep near Nantucket Island, Massachusetts. It took about five months before searchers pulled the plane's second engine from the ocean, and the National Transportation Safety Board did not release its final report on the crash until March 2002. There were also problems in the investigation into Swissair Flight 111, which crashed September 2, 1998, into the Atlantic Ocean off the coast of Nova Scotia. The water was only 180 feet deep, but it took searchers nine days to find the cockpit voice recorder. CNN's Eliott C. McLaughlin, Brian Todd, Khadijah Rentas and Mike Ahlers contributed to this report.